I try to spend part of every day with my Mexican friends. First, it helps me to improve my Spanish (lost cause?). But more important, it makes me feel part of the community and yes, even a bit Mexican. relationships - I meet their wives, children, grandchildren, etc. Some of my relationships have been documented in prior blogs; for example, Victor at El Pollo Machin, Gustavo at the Honda dealership. Today's blog continues that tradition. 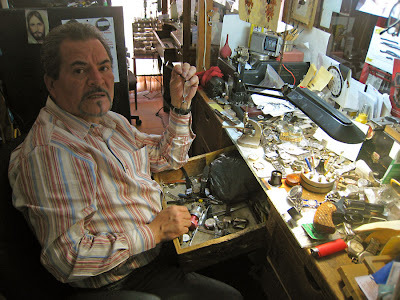 One of the people I see and admire most is Raul Vazquez, who sells watches and jewelry. He and his son (also named Raul) live next door to their shop, and share the workload. They work six days a week. Raul has a daughter, son-in-law and grandson who live in Ashland, Oregon. He almost always has time to spend with his friends, including me. In fact, he has so many friends, that sometimes I have to stand in line to chat with him. Although both Raul look quite serious in the photo of the two of them, they generally have smiles on their faces. He is also a talented clock repairman. 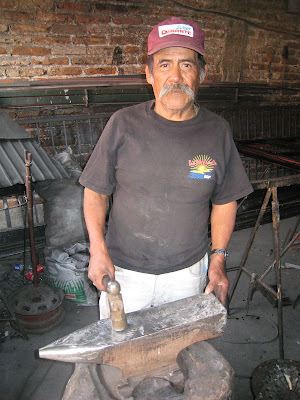 He is responsible for maintaining the town's main clock, in the clocktower at the town square (el Jardin). The mechanism of this clock is more than 100 years old and was made in France. It's quite a responsibility. Raul's shop, though small, is full of hundreds of clocks, watches and gold jewelry. It is neatly laid out and maintained. No job is too big or too small for this father and son team! 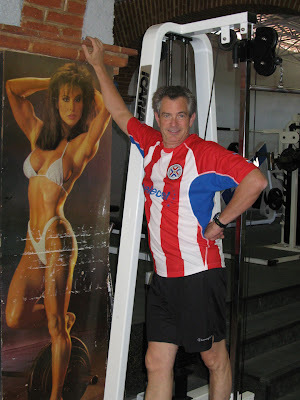 Another person I see frequently is Ramiro Ramirez, who owns the gym where I exercise (theoretically) frequently. Ramiro was trained as an attorney, like his father and brothers, but he and his father own el Lobo (the wolf) gymnasium. 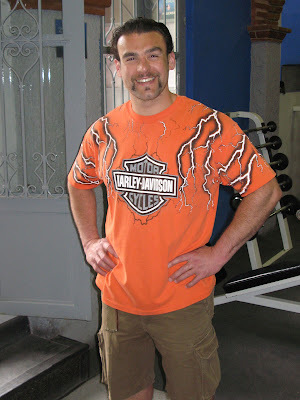 His father (also Ramiro) was a former Mr. Mexico bodybuilder. At 63, he still takes care of himself and still competes. He also rides Harleys and cuts quite a figure in town! Ramiro, Jr., my trainer and friend, is the person who named me Superman. 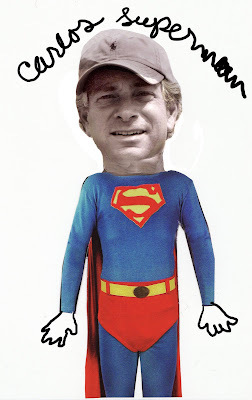 When I started training with him and he heard that my name was Soberman, he dubbed me "Superman." He has taught me many Spanish words and expressions (most of which cannot be printed on this blog). Ramiro is, like his dad, a Harley fanatic. He has taken long rides on his Harleys, and hopes to ride to the Harley factory in Wisconsin this summer for an anniversary ride. I have invited him to visit us in Michigan if he gets to Wisconsin. A third friend is Eulalio Rios (or, as I can him, Sr. Rios). 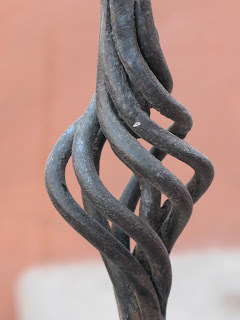 He is a talented blacksmith. 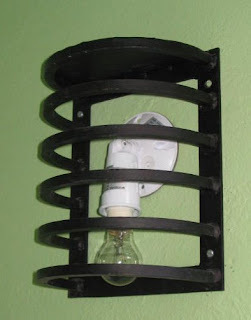 Make a drawing or show him a photograph, and he can make almost anything in metal. 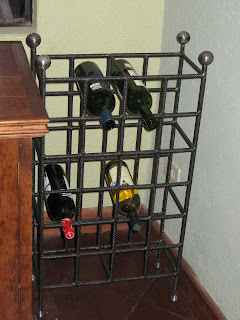 He has made us light fixtures, bannisters and handrails, a coat rack and a wine rack. He works with his four sons, and also rides an ancient Islo motorcycle. His moustache and demeanor are unique. Like my other Mexican friends, he always has time to shoot the breeze with me. 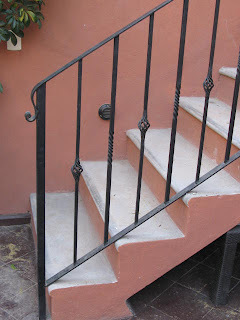 Below are images of some of the work he had done in our house. I'm running out of breath and room to list my other San Miguel friends and acquaintances. You have already read about Linda's friend, cook and student Laura. 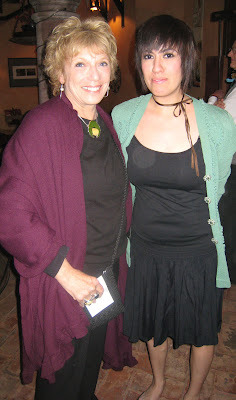 Here the two gorgeous women are at an opening featuring Laura's prints! 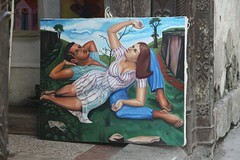 Peter Leventhal, a talented artist...(www.peterleventhal.com). A new friend, but we hope to see more of him soon. 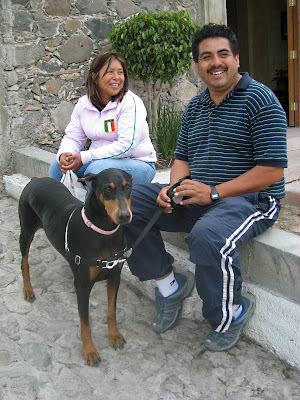 You also have seen pictures of Jorge and Patricia, wonderful friends, though you probably have not seen Rhonda, the doberman who belongs to our friend Wendy Salinsky. Finally (or at least finally for this blog), we have a new acquaintance Norwin Chow (his grandfather was Chinese). Norwin and his brother Leo own a small restaurant called Tako Skina. 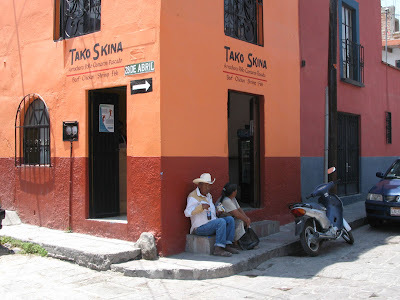 "Tako" is a play on the word "taco", which is, essentially, all they sell. "Skina" is short for "esquina", or corner, since the four seat restaurant sits on a corner. Norwin cooks over a barbecue inside the restaurant! He is the cook, waiter and probably washes the dishes also. 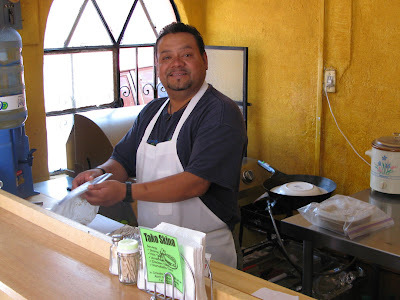 He makes chicken, meat, fish, shrimp and portabello mushroom tacos, as well as delicious beans and cole slaw. Three tacos and beans for 50 pesos (about $4.50). A delicious lunch! i can see why there are few comments. It took me 10 minutes to remember my account name and password.